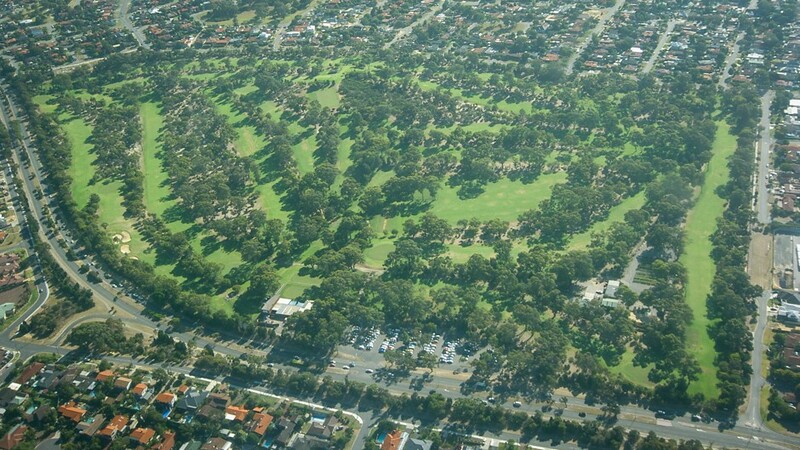 Cottesloe Golf Course, Australia. Photo: Ed Donahue. Question: What could be better than locally grown apples, tomatoes and eggs? Answer: Apples, tomatoes and eggs that your family has grown and nurtured itself. Not only does own-grown food provide all the health, environmental and community benefits of eating local, but it offers invaluable outdoor schooling opportunities for our kids. Nothing could be more important than helping them understand where food comes from, the value of the natural environment and the (increasingly forgotten) pleasures of anticipation as they check the apples ripening on the tree. How wonderfully pastoral… and utopian. The trouble is that I, like so many of us, live in a city of over four million people, in a small apartment, a long way from the countryside. In my part of Sydney, Australia, even a farmers’ market only comes my way once a month. So however nice locally grown food sounds, it’s just too hard to manage for so many of us. But let’s take a closer look. What are the ideal qualities of productive urban land? Sunlight, rainfall, and soil of course — all these are essential. Indeed to grow a few tomatoes, not much is needed. However, to provide fruit, vegetables and ideally even protein through meat or legumes for hundreds or thousands of urban dwellers will take large amounts of land, and preferably land that’s already well greened, irrigated and rich in nutrients. Strangely enough, cities like mine are sitting on a vast resource of exactly the right kind of land: land that is fertile but so far unproductive. Within its greater urban area, Sydney has well over two and a half thousand hectares of such land extremely suitable for providing fresh and local food for many thousands of the city’s residents. Putting this into perspective, at average potato production yields per hectare in my state of Australia, this could produce over 59,000 tonnes of potatoes. Unfortunately this land is not public, but sequestered for use by a small percentage of a wealthy, and most male, elite. I am referring to links, also known as golf courses. Rolling fairways, level greens, water traps and “the rough”, which together make a perfect multi-cropping environment, already irrigated and thoroughly saturated with nutrients. Indeed golf courses provide plenty of room not only for a plethora of vegetable plants, fruit and nut trees, and even for herds of goats, but also for lakes with freshwater carp and tilapia, water-rooted vegetables, ducks and geese. The prospect of productive permaculture environments that provide significant bounty to their local community deep in the city is beguiling. It really could be a simple way to ‘have your city lifestyle cake’ and ‘eat local’ too. There are a number of ways this could work: golf links could be shared with growers; golf links could be reduced in size to allow for growers (perhaps nine holes instead of eighteen? ); or, golf could be encouraged in the resorts and country clubs away from population centres to allow (some) entire urban courses to be repatriated to their local communities for food production, carbon capture, public parkland and outdoor educational uses. I’m certainly not advocating the banning of golf or the complete take-over of urban golf links, but simply a more equitable use of some of this land. Even so, since golf, probably more than any other sport, is played by corporate and political heavyweights, implementing such a proposition would require tremendous leadership and courage. More likely is that proposals for giving over or sharing urban golf terrain with local growers would be met by vociferous scorn from the rich and powerful 2% of Australia’s population who are members of golf clubs. The types of arguments likely to be put forward by golfers will include that there are large amounts of work involved cultivating large areas of land; that no-one will work the land; that it will cost too much to water/fertilize/manage the land without the income of green fees; that, due to the ‘’tragedy of the commons”, the land will be exploited and ruined; that golf courses provide fitness and recreation for large numbers of people and that golfers have a right to their leisure and exercise. There is no disputing this last point, except when a golfer’s ‘exercise’ is taken in an electric cart (powered, in my state, by coal burning power stations). However if golf courses were smaller, perhaps more golfers would walk, carrying their golf bag, and actually get more exercise from a round! But the arguments about labour and cost would be merely excuses. By engaging schools, students, mothers and stay-at-home dads, retirees, families, apartment dwellers without their own gardens and local urban communities, there is a substantial pool of labour not only able but eager to participate. And, as the old adage goes, many hands make light work. So what about the cost? The fact that the outputs are consumable and surpluses saleable will certainly mean that the shared cost of inputs will be outweighed by the ultimate value of the undertaking, especially when considering the many intangible community benefits. Most of all, based on my local community at least, the opportunity to plant trees, grow vegetables, keep beehives and tend chickens is of far greater interest and importance to my neighbours than playing golf. As to the tragedy of the commons, blogger Ian Angus argues sensibly that the tragedy only occurs in a capitalist, competitive environment where a resource is exploited for profit. History demonstrates that where a resource is shared for the common good, it will be managed and maintained for sustainability. This is not about the sale of parcels of golf course land to the highest bidder and the enclosing of more private property — completely the opposite. This is about the use of a shared resource to be utilised as the community best sees fit and with each community member contributing to the extent of their capability. None of this is mere idealism, nor is it unprecedented. These ideas are now common in contemporary culture, like the UK community co-operative Bramble Farm celebrated in Hugh Fearnley-Whittingstall’s River Cottage TV series and the rooftop farm in Brooklyn, New York that is shown in this video. Resources like golf courses can make local initiatives such as urban community farming not just a dream but a reality — one that involves both golfers and the wider communities of which they are part. Links To Local Food by Ben Shepherd is licensed under a Creative Commons Attribution-NonCommercial-ShareAlike 3.0 Unported License. Ben Shepherd is a researcher in Food Security with the Centre for International Security Studies at the University of Sydney, where his main research interest is the relationship between hunger and conflict. In light of this he has a deep personal interest in sustainable food supply solutions. Brilliant. Probably to help get this message across i suggest that golf be modified slightly. Fruit and veg should be incorporated into the game. Players should be incouraged to take long deep diviots (turns the soil over). Perhaps balls replaced with nuts (driving ranges could also serve as effective de-shelling processing plants). Extra potatoes that are unearthed in a sand trap shot increase the chance of getting something into the hole. A hole in one should be left there and encouraged to grow into something (what a reminder eh). There is no limit to this. I see great potential. Too true. We need more community awareness about the food chain, and more pressure on both the public and private sectors to put our open spaces to better use. Time to bring back the Victory garden! At first I saw this as a great idea. I agree that many golf courses have more land than is needed for golf to be played on and on the other hand many city dwellers do not have spaces for gardens. However I can see problems with access to the gardens when golfers are playing unless the gardens are set up in such a way that access does not cross a played fairway. There would be need for some sort of ownership rights to any produce grown in fairness to the gardeners who planted and tended the gardens. These are not problems that could not be overcome though and as time goes on we really do have to look seriously at ideas like these. The carts provide transportation of tools (a hoe in your garlf bag) and mature produce.